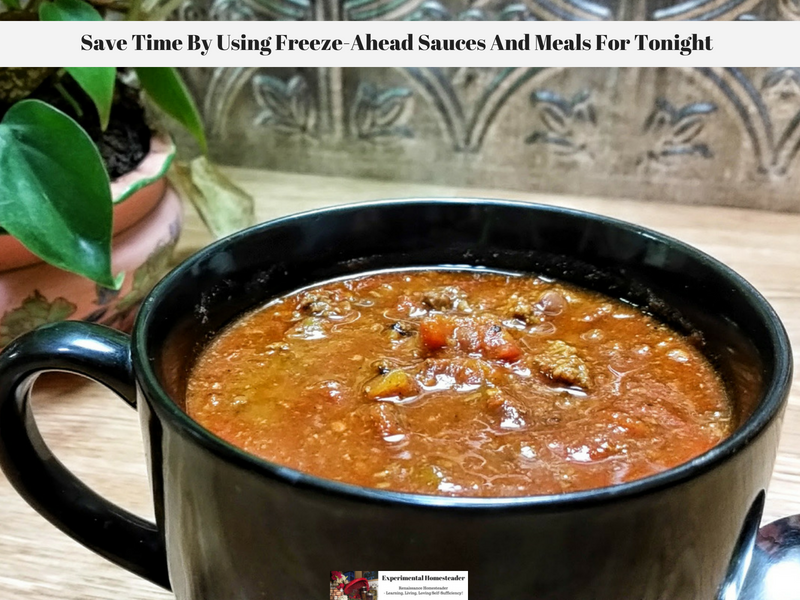 Save time by pre-preparing freeze-ahead sauces and meals for tonight – or any night when you need something delicious and nutritious but simply don’t have time to cook. Have you ever wished you could fill your freezer with meals that are prepared so all you have to do is heat and eat? Yes, you can buy these pre-made. They are called TV dinners, but we all know they are that they are not the healthiest option not to mention they often come in the foods your family doesn’t like. You could make your own freeze-ahead meals and sauces just like I do here on my homestead. It will take some time to learn the best methods and what meals work out the best for your family, but it is comforting knowing you have those meals on those nights that you simply don’t want to cook or have been so busy cleaning stalls or preserving food that you are too exhausted to cook. Preparing freeze-ahead meals takes time. Start by planning which meals to prepare, then make a shopping list, purchase the food and then do the actual cooking. For those who are preparing meals with food they grow in their garden, be sure you pick enough fresh produce to make the meal. It is a pain to stop and go pick produce in a rush because you didn’t pick enough the first time around. It is recommend that you do this type of cooking over at least two days so you don’t feel completely frustrated trying to rush and get it all done in one day – especially if you are new to doing these make-ahead meals. One of the easiest types of meals to do as a freeze-ahead meal is a casserole. You simply put the ingredients together in an aluminum pan, cover it and pop it into the freezer. When the time comes to eat it, you will be glad you spent the time making it because all you have to do is put it into a preheated oven and cook it. Lasagna is one of the most popular meals for families to make ahead and freeze. You will need noodles, spaghetti sauce – homemade or store bought, cheese and meat. 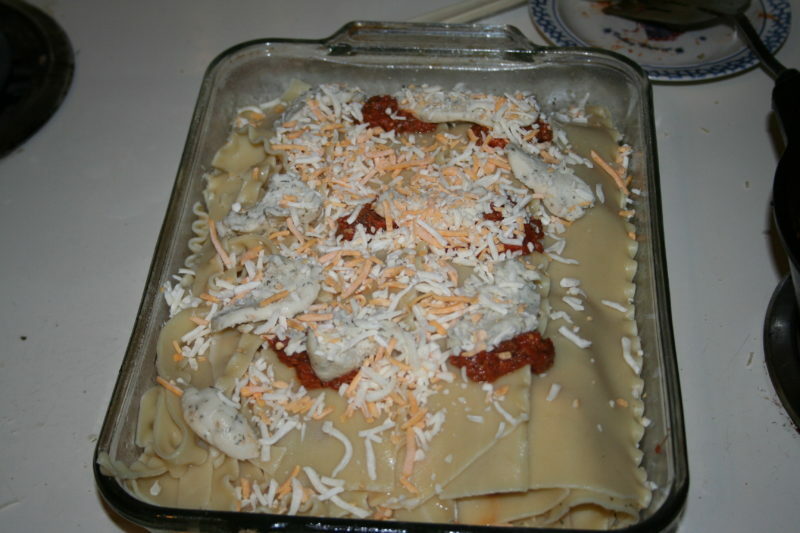 Prepare the lasagna the same way you would if you were going to eat it right away except you do not bake it. When you have added the last cheese layer, place a cover on the pan and let it cool in the refrigerator overnight before placing it into the freezer. Doing this helps to ensure it freezes uniformly. You can also make your favorite soups to freeze for later use. 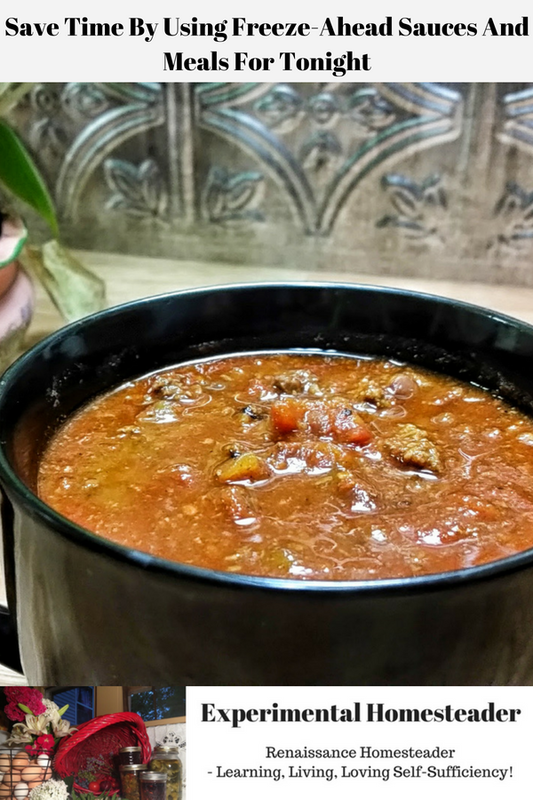 Chili is welcome in the colder months but you might not always have to time prepare it. Make a big pot of chili, break it down into smaller amounts that your family would eat for one meal, and place the containers in the freezer. When you want a bowl of chili, it will be so much easier to reheat the frozen chili than what is would be to make an entire pot. Spaghetti is a common meal families prepare on a regular basis. Cans or jars of sauce at the store are expensive and it seems prices continue to rise. Rather than turning to store bought sauce, make your own and freeze it. Buy tomatoes when they are on sale – or better yet, grow your own – and prepare the sauce with your favorite ingredients. 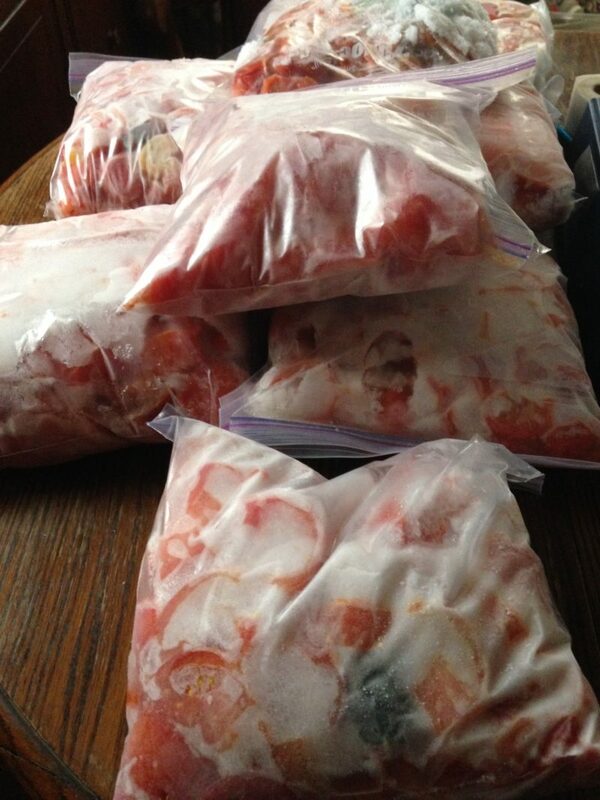 I often chop fresh tomatoes from my garden into quarters and put them into a freezer bag. I then freeze the tomatoes – there is no need to skin them at this time – then when I am ready, I cook the tomatoes down. Yes, the skins can be an issue but using a blender to chop those skins up eliminates the majority of that problem. Now you might still have a few pieces of skin but those can be removed. Perhaps you have come across a great sale on ground beef. Cook the meat right away using onions and simple seasonings. You can freeze enough in one container for a variety of meals – spaghetti, tacos, shepherd’s pie, burritos, enchiladas or pirogues. Consider all the ways you normally use ground beef. You can also make meatloaf ahead of time and freeze it. Freeze-ahead meals are so helpful when you are rushed for time. The effort at the beginning of the process might seem excessive but the time is definitely well worth it. To make the process easier, enlist the help of your family or cook with a friend! You can share the work load and the foods that prepared. Get yourself a good freezer meal prep book too – and don’t forget to include cooking instructions with your meal. I label mine with the name of the meal, the date it was prepared as well as how to cook it. This really helps in the event that someone else is doing the cooking or you forget what you made. Previous Post: « What Goes Into Your Emergency Evacuation Bag?